From the moment of Figaro’s entrance, this “Barber” hits the accelerator; fortunately, it offers more than just fast pacing and high energy levels. The action never stops. Flashing colored lights, doors and windows snapping open and slamming shut; singers leaping and bounding out of the wings and onto the stage, and streamers cascading downward in the grand finale. 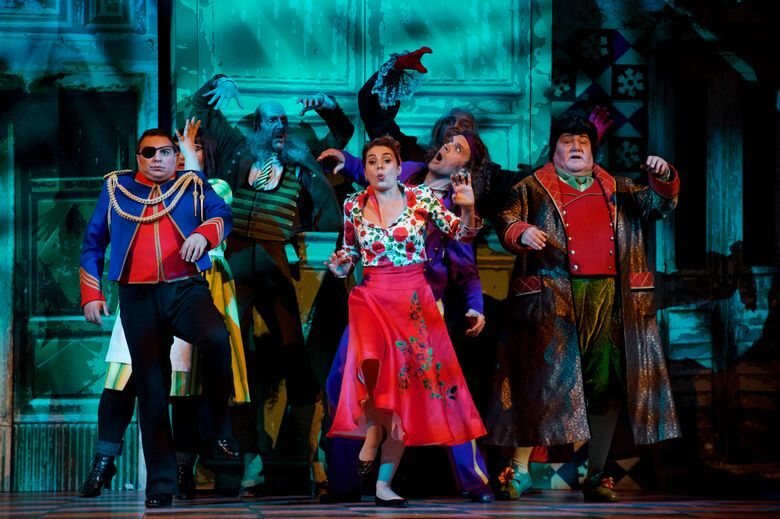 For sheer activity level, on a scale of one to ten, Seattle Opera’s production of “The Barber of Seville” probably scores a twelve. It’s as if stage director Lindy Hume and her production crew decided on “perpetual motion” as the concept for this opera, whose plot is already crammed with schemes, disguises, multiple identities, pratfalls, and ruses of all kinds. From the moment of Figaro’s entrance — popping into the audience, hopping onto the stage, posturing and lighted like a particularly vain rock star — this “Barber” hits the accelerator as cast members appear and vanish through the set’s nine doors and 12 windows. Designer Tracy Grant Lord has provided the perfect ultra-busy, over-the-top set for all these entrances and exits. The resulting show can be a bit exhausting to watch, but fun nevertheless — and you’re not likely to be bored. By Rossini, in Seattle Opera production, with Giacomo Sagripanti conducting. McCaw Hall, Seattle, through Oct. 28. Tickets from $15 (for Family Day, Oct. 22), and from $59 other performances; 206-389-7676 or 800-426-1619, and www.seattleopera.org. Fortunately, this “Barber” offers more than just fast pacing and high energy levels. Headed by the charismatic performance of John Moore in the title role of Figaro (aka the Barber of Seville), Saturday night’s opening cast offered excellent singing and persuasive acting from all three principals — also including the pertly charming Rosina of Sabina Puértolas and the ardent Count Almaviva of Matthew Grills. They all have distinctive voices; Puértolas has an agile top register in a role that also asks for plenty of low notes, and Grills’ elegantly produced tenor was accompanied by a stylish and comic stage presence. Moore’s Figaro was the standout here, however, with a handsome timbre, unflagging energy, and an easy command of the stage. This well-matched trio worked together with split-second timing on opening night, as they schemed to outwit Rosina’s guardian Dr. Bartolo and pair her up with the Count instead. Their Bartolo was the excellent Kevin Glavin, whose bluff-and-bluster bass and shrewd stage sense were ideal for portraying this hapless villain. The resonant bass Daniel Sumegi’s clueless Don Basilio provided deft comic touches and some of the production’s strongest singing. Ryan Bede was a fine Fiorello; actor Marc Kenison (aka Waxie Moon) was fun to watch in the non-singing role of Ambrogio. And mezzo-soprano Margaret Gawrysiak, as the servant Berta, shone in her powerhouse aria (“Il vecchiotto”) about the craziness of people in love. 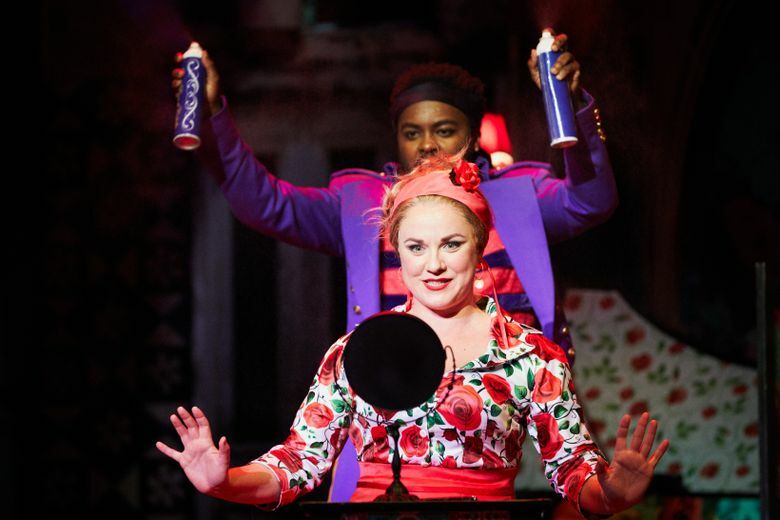 On Sunday, three new principals in the alternate cast took over the roles of Rosina (Sofia Fomina), Almaviva (Andrew Owens) and Figaro (Will Liverman). Fomina displayed a stellar array of coloratura flights and high notes, along with plenty of charm; Liverman’s warm, agile baritone was enhanced by a suave and savvy stage presence. Owens sounded decidedly underpowered and was often difficult to hear. From the familiar overture to the sparkling finale, conductor Giacomo Sagripanti sustained the show’s forward momentum with speedy transitions and deft support of the singers. He allowed the cast plenty of expressive leeway in the arias so well known to opera lovers. Sagripanti also provided the musically authentic and essential fortepiano continuo that deftly knit together the score. Guitarist Michael Partington, who appeared on the stage to accompany key arias, gave the performances both musical expertise and genuine period flavor. Daniel Pelzig’s Spanish-accented choreography and Matthew Marshall’s imaginative lighting enhanced the look of the show. The chorus, prepared by John Keene, looked snappy, and appeared to be having a terrific time. And so, judging from the applause levels, did the audiences.